Boil water in a deep pan on medium heat. Add carrots & cook for a minute. Add brocolli & cook for further 2 minutes. Reserve 3/4 cup water, drain the rest. Refresh the vegetables in cold water. Keep aside. Thinly slice white part of spring onions. Diagonally chop the greens in 2 inch pieces for garnishing. Keep aside. Have all the other vegetables chopped & ready to cook. Combine corn flour/corn starch, soy sauce in the reserved water. Mix well till smooth. Add chilli paste, vinegar & mix well. Keep aside. Heat oil in a wok(kadai) on medium-high heat. Swirl the oil around the wok to coat it. Add minced garlic & ginger & cook for 15 seconds. Add the onion, spring onion whites and stir-fry for a minute. Add the carrot & stir-fry for another minute. Add bell pepper & stir-fry for 2 minutes or till cooked but crisp. Add thai chilli & broccoli. Stir-fry for 1 minute or until broccoli is bright green. Add reserved sauce, salt & cook, stirring until it thickens. Adjust the seasoning as per your taste. Garnish with spring onion greens. Serve immediately with noodles or rice. My son really want a spicy dish every day. 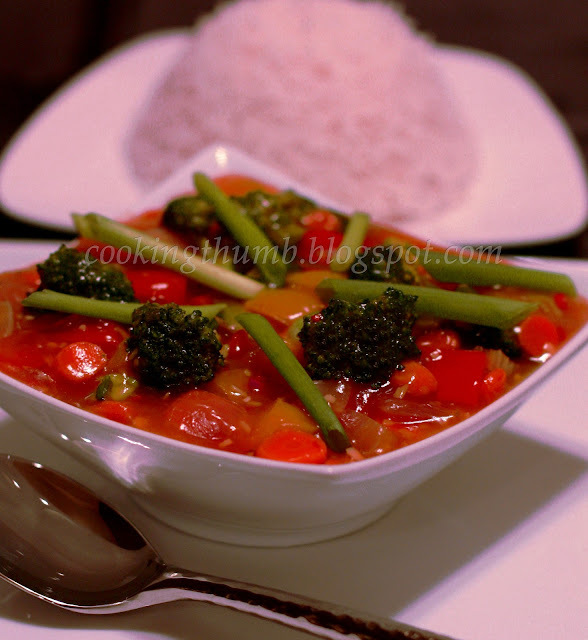 That's why I searching in the internet about spicy stir fry vegetable. And I'm glad because I found your blog. Thank you so much for sharing this one. We are happy to have you here, Pricilla. Glad to hear that your son likes spicy dishes, you have come to the right place. Any of the dishes on our blog can be made as mild or as hot as you want by adjusting the spice level. Many more dishes coming your way soon!